NASA astronaut Anne McClain assists during a spacesuit fit check with Christina Koch (left) and Nick Hague (right). Two NASA astronauts were on the verge of making history this week by becoming the first women to take a spacewalk unaccompanied by men. But due to a lack of appropriately-sized spacesuits currently at the International Space Station, that major milestone for women in space won't be reached this week after all. NASA astronauts Anne McClain and Christina Koch were scheduled to take a spacewalk together on Friday, March 29. However, the agency announced on Monday (March 25) that astronaut Nick Hague would be taking McClain's place, due to a spacesuit sizing issue. Like most spacewalking women, both McClain and Koch wear an extravehicular mobility unit (EMU) suit with a size-medium hard upper torso (HUT) — the smallest size that NASA has to offer. Of the six HUTs currently aboard the station, two of them are size medium, two are large and two are extra large. However, only one medium and one large suit are currently in a usable condition; the rest are spares that would require about 12 hours of preparation before astronauts can safely wear them on a spacewalk, NASA spokesperson Stephanie Schierholz told Space.com. NASA astronaut Anne McClain is pictured during her first spacewalk on March 22. Because spacewalkers typically go out in pairs, the astronauts had prepped two suits, one medium and one large, to be worn for a series of three spacewalks scheduled for March 22, March 29 and April 8. While Koch has always worn a size medium during underwater spacewalk training back on Earth, McClain had trained in both a medium and a large. 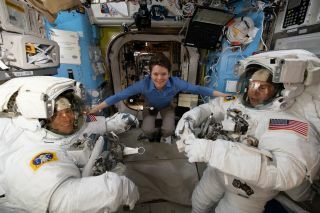 When McClain took her very first spacewalk last Friday (March 22), she wore the medium suit while Hague wore the large suit, Schierholz said. For the second spacewalk, NASA was planning to have McClain wear the larger size so that her slightly smaller counterpart could wear the medium. However, after McClain successfully completed that first spacewalk wearing the medium suit, she decided that she would rather not size up to a large for her second spacewalk. "Based [on] her experience in the first spacewalk in the series, McClain determined that the medium was a better fit for her in space," Schierholz said. NASA astronaut Anne McClain, wearing a size medium spacesuit, works outside the International Space Station during a spacewalk on March 22. So, NASA decided to swap the crew's spacewalking assignments, with Hague taking McClain's place for the second spacewalk and McClain taking Hague's assignment for the third spacewalk on April 8, when she'll head out with Canadian Space Agency astronaut David Saint-Jacques. "Given the very busy operational schedule on board the station this spring — the spacewalks as well as several resupply missions that will begin arriving in April — the teams made the decision to keep the schedule by swapping spacewalkers rather than reconfiguring a spacesuit," Schierholz said. "This decision was based on my recommendation," McClain tweeted today (March 27). "Leaders must make tough calls, and I am fortunate to work with a team who trusts my judgement. We must never accept a risk that can instead be mitigated. Safety of the crew and execution of the mission come first." The news that the first all-female spacewalk would not happen this week sparked conversations on social media about sexism and gender bias at NASA. Even former presidential candidate Hillary Clinton chimed in on Twitter, suggesting NASA "make another suit." But it's not that simple. Because McClain was able to train in both medium and large suits back on Earth, NASA figured that she would probably be fine wearing the large suit on her second spacewalk. However, figuring out what size spacesuit an astronaut needs is a bit more complicated than simply taking measurements and trying on things like you would if you were being fitted for a business suit at a clothing store on Earth. Spacesuits don't always fit quite the same on Earth as they do in space. This is partly due to the effects of microgravity, or weightlessness. If a suit is too big, an astronaut in space might feel like they're floating around inside of it, making them struggle with mobility. That extra space inside the suit can be less noticeable when working in Earth's 1-gravity environment. "Astronauts who do not fit comfortably into available suit sizes can have increased accessibility issues," according to a report from the NASA Office of Inspector General (OIG). "For example, temperature is controlled through a rotary dial on the front of the EMU, which means smaller astronauts face visual and mechanical disadvantages that limit their ability to properly control suit temperature." On the other hand, wearing a HUT that is too small can cause shoulder injuries, the report states. Further complicating the matter, astronauts often grow taller while in space. After a spacesuit fit check on March 4, McClain tweeted that she had grown 2 inches (5 centimeters) since she launched into space. Unfortunately, the extra height didn't help with the fit of the large HUT. "When they launch … we know pretty well what suit size they are, but of course your body changes slightly in space due to fluid shifts or spine elongation, so we do re-fit suits to the crewmembers and make sure that they have the optimal fit to ensure efficiency when we're going outside for a spacewalk," Mary Lawrence, NASA's spacewalk flight director, said in a news conference on March 19. See how NASA's Extravehicular Mobility Unit (EMU) spacesuits work in this Space.com infographic. McClain certainly isn't the first woman to face problems with spacesuit sizes. When the suits were originally designed for the shuttle program some 40 years ago, NASA had planned to offer a broader range of sizes to accommodate as many astronauts as possible. However, to reduce spending, the agency ended up developing only three sizes (medium, large and extra large), which would fit most astronauts. In other words, they built suits to fit the average man. Because very few astronauts were women back then, the spacesuits were never built for women in the first place. Even Peggy Whitson, a retired NASA astronaut who holds multiple spacewalking records, has voiced her struggles with the oversize suits. "As a woman, doing spacewalks is more challenging, mostly because the suits are sized bigger than the average female," Whitson said in an interview with Makers in 2017. In its 2017 report on spacesuit development, NASA's OIG writes that the agency's EMUs available today "do not provide a sufficient range of sizes in the Hard Upper Torso component to accommodate astronauts whose body size may not align with historical measurements." Since those "historical measurements" were taken, NASA's astronaut corps has grown increasingly diverse. The 2013 astronaut class — which included McClain, Koch and Hague — was the first class with an equal balance of men and women. But even as NASA continues to improve its gender diversity, the agency won't be building any new EMUs for women who take spacewalks at the International Space Station. NASA is planning to stop funding the station in 2024. For now, women can hope that a better selection of suit sizes will become available for future astronaut endeavors to the moon, to NASA's lunar gateway space station and eventually, Mars. Email Hanneke Weitering at hweitering@space.com or follow her @hannekescience. Follow us on Twitter @Spacedotcom and on Facebook.